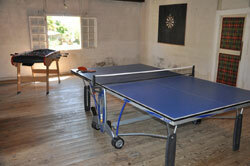 The games room in the barn is home to table tennis, darts and table football. You'll find plenty of new bats, balls and darts for your use, as we replace them every spring. 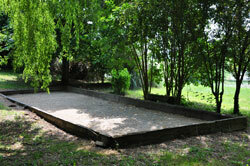 Under the shade of a large willow tree we have the petanque court. The scene of many a long afternoon of intense competition, supping cold drinks and nibbling on Jean Claude's tarte d'oignon. You'll find numerous sets of boule in the barn. 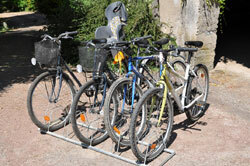 We have five bicycles for guest use at La Bique. Head down to the river and follow the riverbank all the way into the village for the morning bread run, or be a little more adventurous and take a picnic on a day's exploration of the surrounding countryside. Being avid readers ourselves, we have literally hundreds of books at La Bique. I'm sure we have something to interest every guest. We have numerous board games to keep you entertained in the evenings, or on days of inclement weather. We have a TV and DVD player in the TV room, so that kids can amuse themselves without disturbing the parents, but if that is being used as an extra bedroom, then both can easily be moved into the living room. 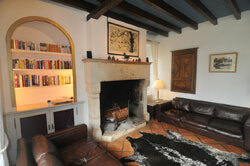 We have had a wonderful time, with excellent attention and service from Monique and Jean-Claude.